I am so excited to begin our musical journey together! This section clarifies some very common responsibilities and obligations that teachers and students have with each other. Always be prepared for your lesson. Daily practice is vital to musical progress. I cannot stress this enough! Since I only see students one day a week, my primary job as a teacher is to teach students how to practice at home in the most time effective, fun way possible. Practicing means working on the material assigned at the previous lesson as written in their notebooks. If a student does not do their part by practicing during the week, I have nothing new to teach at their next lesson. All students must practice a minimum of four times a week for 40 minutes each time. For younger students, 10 and under, practice must be part of the everyday routine for 20-25 minutes. Parental involvement is key and are encouraged to sit in on lessons to know what is going on. This is especially vital for young beginners. One strategy that works well is to schedule your practice time. Don’t just leave it to chance, i.e. practicing when you “feel like it.” I always tell students that if we brushed our teeth only when they felt like it, we would all have a mouth full of cavities! Students who are consistently unable to meet practice requirements will not be able to continue with their lessons. Please read the supplemental practice sheet I have provided. Each month’s lessons are to be paid in advice at the beginning of the month. Payments received after the 10th of the month will be charged a $10 late fee. There are four lessons each month on the same day at the same time. However, if your scheduled weekday has 5 days in any given month, we will take the 5th lesson of the month off. If you are a new student starting in the middle of a month, you will be responsible for bringing in partial payment for that month at your first lesson. The only contract you have with me is on a month to month basis. 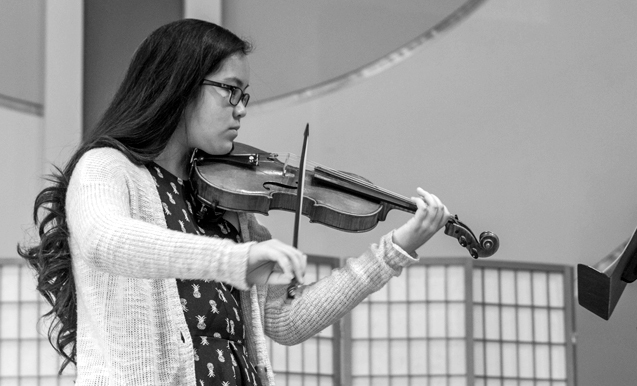 Violin lessons continue year round. Major holidays for the Peninsula School District will be observed (translation: no lessons during all school breaks, including Spring Break, Memorial Day, MLK Day, and in-service days). There are lessons during the summer. Lesson times must be kept accurate. Lesson times must be kept accurate; they are a kind of professional contract that needs to be honored and taken seriously. It must be understood that parents are paying for the teachers’ time and preparation, not the individual lesson. Therefore, cancellations made without 24 hours notice will result in loss of the lesson fee. (Example: if a lesson is schedules for 1:00 PM Tuesday, it must be canceled before 1:00 PM Monday or the entire fee for that lesson will be due). With more than 24 hour notice, a make-up lesson can be scheduled or the payment can credited to the next month’s lesson fee. Lessons that are skipped without adequate notification are not eligible for rescheduling a makeup date. If I am sick and have to cancel a lesson, your tuition will be adjusted the following month. Your lessons are very important to me and I take great pride in seeing your individual improvements. I am looking forward to these lessons with you and to the exciting results that await. I teach students from many different schools with many different strains of “ick!” I expect students to wash their hands as they arrive to lessons. I have a hand sanitizer dispenser in the studio. All students are expected to keep their fingernails clipped. Playing the violin actually makes them grow faster! Students must ALWAYS bring all music books and homework notebook to every lesson. You will receive a CD at your first lesson. It is yours to keep! Your homework is to listen to it and circle your favorite tracks. I take pride in finding pieces that each students loves to play, and knowing what kind of music you like helps me narrow down my hunt! Recitals are potluck events held twice yearly, in mid-November and mid-May. They are relaxed, supportive, and fun! They give students a chance to get to cheer each other on. A pianist will be accompanying all students to make them sound their best! We also prepare a group piece to perform all together at the end of every recital. There is no admission, but a $50 recital fee is added to that month’s tuition to cover venue rental, plates/cups/napkins, certificates, and roses for each student. Pianist cost is also extra for each student, paid to the pianist, usually $35-40, which covers having him/her at our lesson for practice before the recital, and the recital itself. Lesson homework almost always consists of the following idea: “vegetables” (i.e. the exercises and etudes that introduce new techniques), and “dessert” (i.e. the fun song(s) piece that we pick together which makes you excited to practice in the first place. Remember: doing the vegetables first makes the dessert taste better! The easiest way to reach me for questions (even if it’s mid-week and you have a random practice question!) is by text, then email cora.reuter@gmail.com.